Every fall and winter I get a craving for these cookies! I’m not sure why I crave them so much that time of year when they really would be perfect to enjoy throughout the year. These perfectly chewy cookies get a little tang from the dried cranberries and the perfect sweetness from the white chocolate & semi-sweet chocolate chips. You can make these yummy cookies with white chocolate chips, semi-sweet chocolate chips or a mix of both. If you are lucky enough to find these delicious white chocolate/semi-sweet chocolate swirled chips like I used, definitely use them in this recipe. They are so good! In the past, I used these Nestle Toll House Semi Sweet Chocolate and Premier White Swirled Morsels but haven’t been able to find them in stock anywhere so I’m not sure if Nestle is still making them or not. If you find those, make sure you double-check the ingredient list since I can’t say whether they are gluten-free or not. The chips I use are Callebaut Dark & White Duets, bought in a 5lb bag on a recent trip to a cooking/baking supply store and the ingredients list is free of gluten. If you haven’t purchased gluten-free oats before, check out my Recommendations tab for more info on the brands I like. I used gfJules instant oats in this recipe. I love to bring these to parties, potlucks, and gift exchanges and everyone always loves them. Let me know if you give them a try! If you can't find the swirled chips, feel free to use 3 oz. white chocolate chips or chunks and 3 oz. semi-sweet chips or chunks. Preheat oven to 375°. In the bowl of your electric mixer, combine the sugar, brown sugar and butter; mix well to cream together. In a small bowl, whisk together the cinnamon, baking soda, salt, flour, and xanthan gum. Add the dry ingredients to the mixing bowl and mix well. Using a rubber spatula, fold in the oatmeal, dried cranberries, and chocolate chips until all ingredients are uniformly distributed. Using a medium sized cookie scoop, scoop cookies onto cookie sheet that is lined with a silicon liner or parchment paper. Bake at 375° for 10-12 minutes, just until the edges are lightly golden. Remove from oven and let cool a few minutes on the cookie sheet, then transfer cookies to a cooling rack. I recommend Gluten Free Mama's almond blend or gfJules all-purpose gluten-free flour blends. I recommend gfJules instant oats. As always, be sure to double-check your ingredients for gluten. Feel free to try this with your preferred gluten-free flour blend, but I only guarantee a delicious, non-gritty result if you use one of the flours I recommend! Looking to try out this recipe but it’s missing the amount of cranberries to use :). Let me know what it is. I’m eager to make these! I don’t know how I missed that all this time! 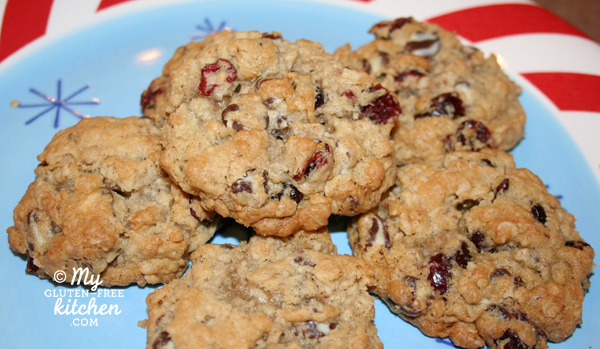 The recipe should say 3/4 cup dried cranberries. I’m off to add that now! Thanks so much for pointing out that omission. Thanks for the super quick response! I’m off to make them now! Could you do all raisins instead of the cranberries and chocolate? Made these tonight!! They came out perfect!! I did make a couple minor changes because I have to avoid dairy; used Earth Balance Vegan Butter sticks. I also doubled the vanilla and deleted the cinnamon. They came out perfect. Found dairy free white chocolate chips on Amazon in case anyone needs them- Liebers Decorating Chips. Thanks for the recipe, this is a keeper. I used Bob’s red mill gf flour and oats.